... but then I was wrong! You have a great idea for your next artwork. Now what? I was preparing a workshop for Arts Etc., the surface Design group in which I’m a member. It was my turn to teach this past month and this was to be my lesson. And I felt good about my plans. I spend a lot of time on developing concepts for my work. I sketch. I try them out in Photoshop. I enlarge manually to be sure the vision works at full size. I’m competent at the math of proportions so I get the image to fit right. And I’ve developed a few personal tricks to help me “see” the concept as a composition and to make good cropping decisions. All good. Feeling well prepared to teach the lesson, I had – for a little while – gotten into the happy thought that I had pretty much conquered this topic, and that what I was going to teach was THE composing method textile artmakers would need most. Then, the night before the workshop, I visited a thought-provoking exhibit of work by textile artist Lauren Austin, exhibiting at the Yvonne Scarlett Golden Center in Daytona Beach. What a wonderful body of work. The mages are still inside my head. 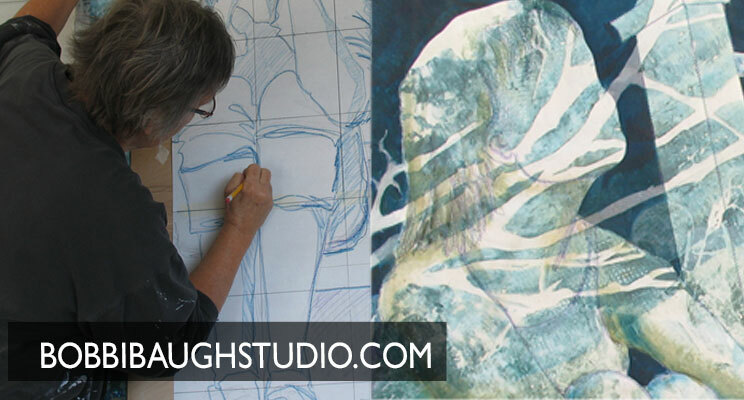 Her works are lyrical, and spiritual, with a meaningful array of images that repeat throughout the body of work. And, it was obvious from absorbing these works how intuitive she is in her making. The compositions are strong and interesting. They seem to come from the images, not to dictate them. Shaken to think in a new way (one of the great things that can happen when interacting with another artist’s work) I realized – of course – that there are different ways to get your idea down on the fabric. There are as many ways to handle the nuts and bolts of artmaking as there are artists and art ideas. I did teach the next day. I do believe it was a good working class and offered some helpful ideas. But I shared with the group that my guideposts to traveling from idea to artwork are just my way. But not the only way. And my way, I hope, will also grow and change.